e-Book: Climate Change is a Geographic Problem: The Geographic Approach to Climate Change. Read the e-book. e-Book: GIS for Climate Change: Case Studies in the Use of GIS for Climate Change. Read the e-book. By serving these layers as live image services, that is, as actual data as opposed to pictures of data, citizens, scientists, and policymakers can ask questions of landscape layers that honor the complexity of the data. African Landscape Modeler: Analyzing areas of high maize production with a dependent population, which is prone to climate change. 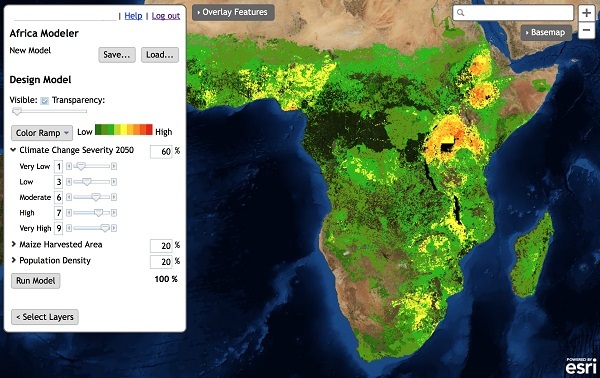 In collaboration with many of our partners, a suite of new landscape data layers and modeling tools are being developed and put in the hands of researchers and planners, enabling the discovery of emergent patterns to inform agricultural practices to reduce hunger, increase food production and improve climate resilience. Given the increasing pressures caused by climate change, land degradation, population and demand for food, its role in informing solutions is likely to become even more critical into the future. Now more than ever, GIS is poised to support researchers and farmers with tools to understand and respond to changing agricultural patterns. e-Book: Farming the Future: GIS for Agriculture, Vol. 2. Read the e-book. Video: Living Well within the Planet’s Boundaries. Jacqueline McGlade, Executive Director of the European Environment Agency shares her strategic initiative on preserving the future of planet Earth. Watch the video. The oceans are our climate engine. They feed us, regulate our weather patterns, provide over half the oxygen that we breathe, and contribute to our energy and economy. And in a world where climate, oceans, and people are tightly linked and interconnected, we must first understand the oceans before we can address the issues of climate change. Geographic information systems (GIS) technology, which has long provided effective solutions to the integration, visualization, and analysis of information about land, is now being similarly applied to oceans. Our ability to measure change in the oceans (including open ocean, nearshore, and coast) is increasing, not only because of improved measuring devices and scientific techniques, but also because new GIS technology is aiding us in better understanding this dynamic environment. This domain has progressed from applications that merely collect and display data to complex simulation, modeling, and the development of new research methods and concepts. e-Book: The Ocean GIS Initiative: Esri’s Commitment to Understanding Our Oceans, by Dr. Dawn J. Wright, Esri Chief Scientist. Read the e-book. Video: Ocean GIS. Esri Chief Scientist Dawn Wright, and Will McClintock and Chad Burt of the University of California, Santa Barbara, discuss and demonstrate the efforts made in ocean GIS with SeaSketch, a new web-based solution. Watch the video. By 2050, estimates suggest the majority of humanity will live in cities–many in coastal areas–and they will need to react to new climate realities. Cities can learn a lot from each other, but until recently this was difficult. Data about our cities is collected at different scales, and in different ways, making comparative analysis awkward, and leveraging what works slow to catch on. Enter the Urban Observatory. This first-of its kind virtual experience takes advantage of GIS technology as an integrative platform that standardizes scale and representation of earth’s cities, so as to visually compare and contrast detailed information from one to another. The result: a greater understanding of city life in the years to come. This type of research and exposure can help cities understand what strategies work, in order to repeat and expand upon them, and what policies to avoid. Lessons learned through the Urban Observatory are likely to impact trillions of dollars in future societal development costs. Video: Urban Observatory. Jack Dangermond and Hugh Keegan introduce the Urban Observatory and how it allows people to explore simultaneous views of major cities located around the world. Watch the video. White Paper: Urban Observatory. This White Paper explains the Urban Observatory, which seeks to provide understanding through comparison and contrast, empowering people to examine, compare, and contrast the global cities of the 21st century. Read the white paper. e-Book: Geodesign in Practice: Designing a Better World. The 12 articles in this e-book show how geodesign is fundamentally transforming the way we think about the world. Read the e-book. For even more resources, see Climate Change and GIS: Resources for Action.